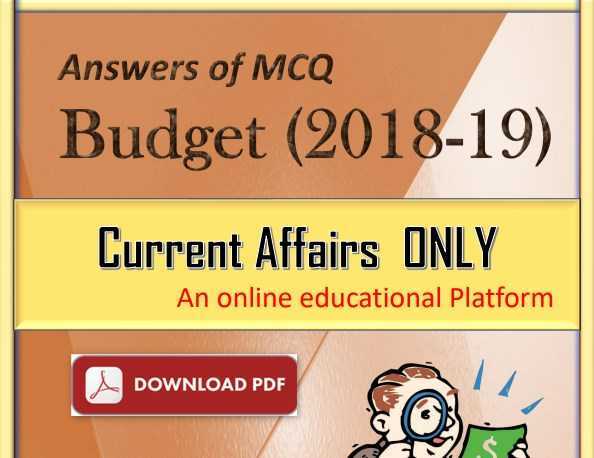 Hello Everyone, आज हम आपके लिए Budget 2018 – 2019 MCQ Questions Current Affairs से MCQ Question आपके लिए लेकर आए है आप इन Question की pratice करे क्योंकि ये Questions आगामी परीक्षा में ज़रूर पूछे जायेंगे तथा हम इसके साथ आपको MCQ Questions के PDF भी दे रहे है PDF डाउनलोड करने के लिए निचे दिए हुए Download Link पर click करके download कर सकते है ! Q.1- Which of the following are the New Funds announced in union Budget 2018-19. Q.2- The Union Budget 2018-19 has proposed a reduced corporate tax rate to 25% of companies that have reported turnover up to Rs 250 crores in the financial year 2016-17, Consider the following statement about this. i) This will benefit the almost 99% of companies filing their tax returns. ii) This will leave the companies with higher investible surplus. iii) This will create more jobs. Q.3- Referring to the Government’s commitment to the welfare of farmers and doubling farmers’ income by 2022, the government announced a slew of new schemes and measures in union Budget 2018-19. (i) MSP for all unannounced kharif crops. ii) Institutional Farm Credit raised to 11 lakh crore in 2018-19.
iii) Operation Greens launched to address the challenge of price volatility of perishable commodities. iv) New 50000 Rural Haats to protect the interests of small and marginal farmers. v) To set up state-of-the-art testing facilities in all the forty two Mega Food Parks. i) Under Ujjwala Scheme distribution of free LPG connections will be given to 8 crore women. ii) Under Saubahagya Yojana 4 crore poor households are being provided with electricity connection. iii) More than one crore houses will be built by 2019 in rural areas, to fulfil target of housing for All by 2022.
iv) 6 crore toilets will be constructed under Swachh Bharat Mission till March 2019.
i) Loans to Women Self Help Groups will increase to Rs.75,000 crore in 2019.
ii) It increased to grow about 37% over previous year. Q.6- In union budget 2018-19, the government announced setting up Ekalavya Model Residential School, Consider the following statement about it. ii) by 2022 it will be build in every block with more than 50% ST population. iii) It will focus on preserving local art and culture. Q.7- Which of the following statement is correct about the RISE by 2022 announced by government in Union budget 2018-19? a) It is to step up investments in Education. b) It is to step up investments in health. c) It is to step up investments in telecommunication. d) It is to step up investments in sports. Q.8- Consider the following statement regarding the National Health Protection Scheme. i) It is world’s largest government-funded health care programme. iii) It covers nearly 50 crore beneficiaries. iv) It provides coverage up to 5 lakh rupees per family per year. v) It is provided for primary and secondary care hospitalization. Q.10- Consider the following statement regarding the MUDRA Yojana. i) MUDRA Yojana launched in April 2016.
ii) 76% of loan accounts are of women it now. iii) It is proposed to set a target of Rs.3 lakh crore for lending for 2018-19.
iv) It has successfully exceeded the targets in all previous years. Q.11:- Which of the Public Sector Insurance companies will be merged into a single insurance entity? i) National Insurance Co. Ltd.
ii) United India Assurance Co. Ltd.
v) Agriculture Insurance Company Of India Limited. Q.12- Consider the following statement with reference to Indian economy? i) India among the fastest growing economies of the world. ii) Country is on course to achieve over 8 % growth as manufacturing, services and exports back on good growth path. i) Revised Fiscal Deficit estimates for 2017-18 are `5.95 lakh crore at 3.5% of GDP. ii) The projected Fiscal Deficit of 3.3% of GDP for the year 2018-19. Q.14- Consider the following statement with reference to cleaning the Ganga. i) A total of 187 projects have been sanctioned under the Namami Gange programme in union budget 2018-19.
ii) All 4465 Ganga Grams have been declared open defecation free. Q.15- Under the Bharatmala Pariyojana an estimated cost of Rs.5,35,000 crore has been approved its Phase-I, about how much kms road constructioned in its Phase-I. i) Infrastructure is the one of the growth driver of Indian economy. ii) It is estimated that investment in excess of Rs.50 lakh crore is needed for development Infrastructure. iii) Government announced on infrastructure for 2018-19 to Rs.5.97 lakh crore. Q.18- Consider the following statement with regarding the potential of agri-exports. ii) Indian current agri-exports is US $ 30 billion. iii) To realize this potential, export of agri-commodities will be liberalized. Q.19- Which of the following new Scheme launched by government to address price fluctuations in potato, tomato and onion for benefit of farmers and consumers. i) Food Processing sector is growing at an average rate of 8% per annum. ii) Prime Minister Krishi Sampada Yojana is our flagship programme for boosting investment in food processing. iii) Allocation of Ministry of Food Processing is being doubled from `715 crore in RE 2017-18 to `1400 crore in BE 2018-19.
iv) Government will promote establishment of specialized agro-processing financial institutions in this sector. Q.21- Which among the following steps will be taken by Government for promotion of organic farming. hectares each, will be encouraged. i) An Agri-Market Infrastructure Fund with a corpus of 1000 crore will be set up. ii) The Grameen Agricultural Markets and agricultural produce market committee will be connected online. Q.23- Consider the following agriculture production in India in the year 2016-17.
i) India food grain production was around 265 million tonnes. ii) fruits and vegetables production was around 275 million tonnes. Q.24- Which among the following recently launched digital portal will also be used to upgrade the skills of teachers. Q.26- GOBAR-DHAN scheme is associated with which among the following sector. Q.27- Consider the following statements in reference to Indian Rail Budget 2018-19.
ii) 4267 unmanned level crossings in the broad gauge network in the next two years will be eliminating. iii) All railway stations and trains will be progressively provided with wi-fi & CCTVs. Q.28- Which among the following statement is given INCORRECT? c) Airport Authority of India (AAI) has 124 airports. Q.29- Which among the following will initiate a national program to direct our efforts in the area of artificial intelligence, including research and development of its applications? Q.30- Consider the following statements in reference to phase I of Bharatnet project. i) Task of connecting one lakh gram panchayat through high speed optical fiber network has been completed under it. ii) This has enabled broadband access to over 20 crore rural Indians in about two lakh fifty thousand villages. Q.31- To harness the benefit of emerging new technologies, particularly the ‘Fifth Generation’ (5G) technologies and its adoption, the Department of Telecom will support establishment of an indigenous 5G Test Bed ata) IIT, Chennai. Q.32- Consider the following statements in reference to block chain technology. i) It allows organization of any chain of records or transactions without the need of intermediaries. ii) The Government does not consider crypto-currencies legal. iii) The Indian Government will explore use of block chain technology proactively for ushering in digital economy. Q.35- Consider the following statements regarding the taxpayers in financial year 2016-17.
i) 85.51 lakhs new taxpayers filed their returns of income. Q.36- Which of the statement is correct about is the average tax payment of individual salaried taxpayer and individual business taxpayer. a) Average tax payment of individual salaried taxpayer is more than individual business taxpayer. b) Average tax payment of individual salaried taxpayer is less than individual business taxpayer. c) Average tax payment of individual salaried taxpayer is equal to individual business taxpayer. d) Average tax payment of individual salaried taxpayer is similar to individual business taxpayer. i) The Proposed Pradhan Mantri Vaya Vandana Yojana extend up to March, 2022.
ii) Current investment limit proposed to be increased to Rs. 15 lakh per senior citizen. Q.38- Payments exceeding who much amount in cash made by trusts and institution to be disallowed and would be subject to tax. i) Exemption of interest income on deposits with banks and post offices to Rs. 50,000.
ii) Hike in deduction limit for health insurance premium. Q.42- Which among the following is major source of receipts to government of India? Q.43- Which among the following is the major expenditure of Government of India? Q.45- Consider the following statements. Assertion (A): The tax buoyancy has improved in recent years. Reason (R): The government many efforts to curb evasion. a) A is correct, and R is an appropriate explanation of A.
b) A is correct, but R is not an appropriate explanation of A.
c) A is correct, but R is not an appropriate explanation of A.A is correct, but R is incorrect.